I know some people involved with coffee. Steve, owner of Lao Mountain Coffee, is an acquaintance. He’d be a great source of information to a beginner like me if I weren’t a potential future competitor. He’ll probably never notice me, though. Anyway, the Bolaven Plateau had always been a kind of vague place mentioned here and there. It is famous for its coffee and its waterfalls. I imagined a place that you had to trek for days into, but it’s actually very accessible. From Ubon, where Wrong Way Cafe is on the Thai side of the border, it is only a 3 or 4 hour drive. Literature on the Bolaven Plateau often focuses on two primary economic contributors to the region: agricultural production and tourism. Both contribute greatly to the Plateau’s revenue. The French first began farming and other agricultural techniques in the Bolaven Plateau including the production of coffee, rubber, and bananas in the early 20th century. Since the French’s initial influence, “the plateau remained an important agricultural area growing a wide variety of fruit and vegetables, as well as cash crops such as cardamom”. However, it was the French introduction of the production of coffee that has proved most useful to the region. During colonization, the French introduced the production of “high quality stock of both Arabica and Robusta strains. Production declined during the war years, but is now experiencing a renaissance”. The climate of the Plateau with its cooler temperatures and abundant rainfall makes it the perfect place for coffee production. Most farming families that make up a variety of the aforementioned minority groups are highly dependent on the coffee industry as their source of income. 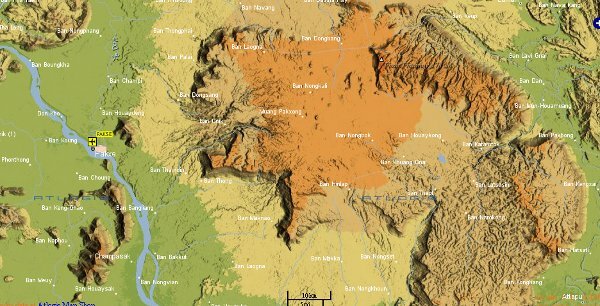 Almost all coffee in Laos is “cultivated almost exclusively on the Bolaven Plateau in Champasak Province in the southern part of the country… Currently, the Lao coffee harvest generates about 15-20,000 tons a year, 80% of which is Robusta. Over the past 20 years, various development agencies and the Lao government have been working with the farmers to introduce hearty, high yielding Arabica plants to the plateau. At about double the price of Robusta, this effort has gradually improved farmer incomes”. Besides coffee production, the Bolaven Plateau has become a place of interest amongst tourists. The Bolaven Plateau’s additional revenue has been from its emerging tourist industry. For example, a simple internet search will inform one that “either Lane Xang Travel or SODETOUR in Pakse offer a variety of guided tours to the Bolaven Plateau, ranging from day trips to 3-4 day itineraries. Prices vary according to the size of the group, as well as the itinerary chosen. Since many of the attractions are located off the main road, and are not sign posted, some sort of guide is recommended”. Businesses guided specifically towards tourism have generated on the Plateau including an abundance of restaurants, resorts, and coffee plantation tours. The influx of tourism has greatly aided the economy of the region and has brought further attention to unique attractions that occupy the area. Tourism has taken a hold in the Bolaven Plateau because of the unique aspects of the region that have triggered great intrigue. The most popular places visited by tourists are the waterfalls in the region, the villages of the ethnic minorities, and other geopolitical areas of interest. The Bolaven Province has countless waterfalls. The Tad Lo Waterfalls that are approximately 58 miles from northeast Pakse are a popular destination. The “lush vegetation” that surrounds the waterfall makes it a desired destination though the fall itself “drops only a few meters”. In addition, one can go “beyond Paksong on the way to Pakse [where] another spectacular waterfall, Taat Fang (also known as Dong Hua Sao), tumbles 120 metres, making it the tallest waterfall in Laos. Well-marked trails lead the physically fit 6 kilometres to the base of the falls”. Tourists have countless opportunities to indulge in the Bolaven Plateau’s beautiful scenery that has begun to capture international attention. Moreover, other tourist attractions include the villages of ethnic minorities who have grown accustomed to sharing their culture with visitors to the region. Travel guides even inform visitors of nearby villages that can be visited: “Alak, Katu and Suay villages can be found within a few kilometres of the resort”. Tourists are also informed of the various markets where they can go and observe the cultures of ethnic minorities and purchase items unique to each culture. The diversity of the region has provoked intrigue amongst tourists who desire to learn about completely different ways of life. The Bolaven Plateau is filled with appealing cultural and geographical areas of interest. Whether it is a boat trip to one of the many waterfalls that occupy the region, a tour of the countless coffee plantations, an elephant day trek, or visiting one of the unique villages of the ethnic minorities, a journey to the Plateau has many educational and interesting opportunities for tourists. You can nourish the author by buying him some beer! Click on the Beer Lao photo! Richard was raised in Stow, Massachusetts. His interest in Asia, especially Japan, took him overseas, where he's been an expat his entire adult life-- assuming he ever grew up. He works as a sales rep for the greatest Japanese company there is, splits his time living in Thailand and Laos, and cannot stop getting involved in things well over his head. In addition to having a pub in Thailand, now he's got a coffee plantation on the Bolaven Plateau in Laos where he intends to experiment with sustainable farming. If he's trying to get home, he's certainly going the wrong way.